Featuring a space saving narrow 8 in. cabinet width, the BUNN-O-Matic hot powdered drink machine is made to serve your customers their favorite beverages! With variable speed hopper motors that offer a wide range of product mix ratios (0.75 to 6.6 grams of powder per second) and large easy-to-fill translucent hoppers ensure quick and timely refilling. The large hot water reservoir provides 4.2 gal/hour serving capacity and the adjustable legs and drip tray allows up to 7 in. opening for 20 oz. cups. Space saving narrow 8" (20.3 cm) cabinet width. Variable speed hopper motors offer a wide range of product mix ratios (0.75 to 6.6 grams of powder per second). Lighted graphics merchandise drinks for maximizing profits. Large hot water reservoir provides 4.2 gal. (15.9 L) / hour serving capacity. Adjustable legs and drip tray allows up to 7" (17.8 cm) opening for 20 oz. cups. 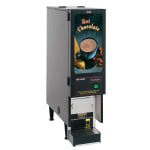 Specially designed mixing system guarantees perfect beverages every time. Improved automatic rinse reduces run-on after beverage is dispensed. Designed to be easily serviced from front and top of machine.